A team of engineers create a lean, mean weed killing machine. The sun is shining on rows of bright green lettuce leaves poking up from the dirt along a California field. It could be a scene from an advertisement for salad dressing, except for the robot a few rows in. It’s less futurist looking than it sounds”“just a tractor with a silver box in back. But don’t let that fool you. The Lettuce Bot will be the future of farming, if its inventors have anything to do with it. The slow moving contraption moves along analyzing the rows of lettuce. The Bot has a database of more than a million images that it uses to identify the plants. It’s looking for a weed or a lettuce plant that’s unwittingly grown too close to another. Once it identifies the offender, it releases a strong spray of fertilizer disintegrating its prey and fertilizing the lettuce around it. It’s this kind of creative thinking that got the Lettuce Bot going in the first place. Heraud and the Bot’s co- creator, Lee Redden, met at Stanford while studying engineering. They wanted to use their understanding of robotics, computer vision, and machine learning algorithms to advance the growing field. The duo first considered an automated lawn mower. But they found their ideas better suited for and more appreciated in the fields. They started Blue River Technology with the intention of bringing advanced technologies to agriculture. The company recently received $3.1 million in venture funding. We chatted with Heraud as he kept an eye on one of his prototypes working away at a California lettuce farm. 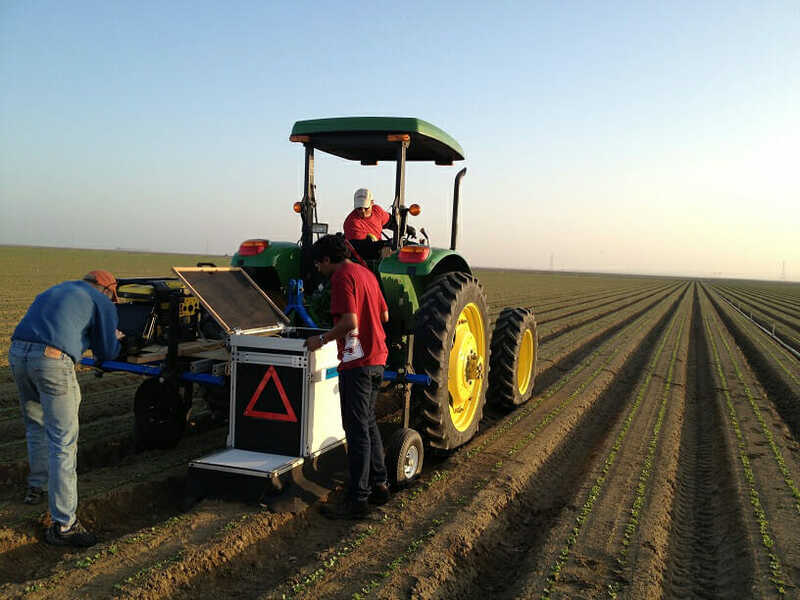 Modern Farmer: When can farmers expect to use Lettuce Bots in their own fields? Jorge Heraud: Before we start selling the machine, which at this point is a little bit complicated to use, what we want to do is start an operating service, and we think we will start this service in the next month or two. We’re very close. Our plan is to charge for the acres. The farmer does not buy the machine out right. What they do is pay us by the acre. We want to charge a comparable amount to doing it the traditional way. What this means is it’s a very low risk for them to try it. They can try us out in a few acres. MF: Will farms have less reliance on human labor in the future? JH: Yeah, absolutely, absolutely. That is the trend in agriculture. In the turn of the century over 50 percent of the American population was involved in farming. Right now that number is less than 2 percent. 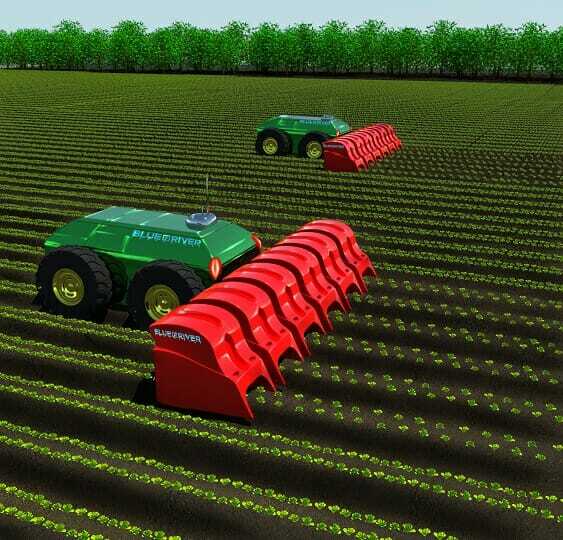 There’s been a huge trend in agriculture to mechanize. MF: What does Blue River bring to agriculture? JH: Agricultural technology for many years has fallen into two camps. Larger: getting efficiency through scale. Companies like John Deere have doing this quite a bit. And the other part where technology has been going has been through biotech and genetics and things of that nature. Companies like Monsanto have been doing this quite a bit. What we’re talking about is bringing technology that is a little bit different: electronics, computers, cameras, and sophisticated algorithms. We want to find different applications for that. Weeding is done now by a combination of genetically modified crops and herbicides that kill everything except the plants that have been genetically modified. So we wanted to bring an alternative to that and have a solution that is scalable, affordable and doesn’t rely on genetically modified crops. MF: Do you have a personal connection to farming? JH: My partner [Lee Redden] comes from Nebraska. His parents farm. From my side, my family was farmers. My grandparents were farmers. I’m originally from Peru. My family farms in Northern Peru. I used to go there for summers. Also I had been an early employee working at Trimble Navigation, which was one of the pioneers of bringing technology in agriculture. I did that for about 14 or 15 years and I was working on GPS gear for tractors. I’ve developed a tremendous amount of respect for farmers and farming and tremendous insight into the common misconceptions of farming. For example a lot of people think that farmers don’t like technology. I found that not to be true. There’s many, many very progressive farmers that love technology and adapting and its very satisfying to solve their problems. I’ve found that farmers are nothing but collaborative. They unselfishly give their time and their land to us. They are very enthusiastic of progress and technology and finding new solutions to old problems. MF: What’s next for the Lettuce Bot? JH: One application for our technology would be a solution for organic farmers. One of the areas where weeds are the biggest problem is organic agriculture. There’s no good practical way of eliminating weeds in an organic field. There’s no practical way other than pulling them by hand one by one. That’s not sustainable. It’s expensive, and it’s backbreaking labor. The fertilizer we use is not organic and is not allowed in an organic field. We’ve been looking for an organic comparable way of thinning. We have several ideas that we’ve started on. One of them is based on a rotating blade. The idea is to kill the plant that way. That would be the natural progression, the next version would be a machine that could work with organic. MF: Will you branch out into other plants? JH: Agriculture is a huge industry and it turns out that every crop has it’s own problems that are a little bit different from each other. There’s a good reason we started with lettuce. It’s the second largest crop in California, and there’s also another reason that was very, very important to us: it’s a year-round crop. They grow it all the time. We could come and test today in the lettuce field, a week’s time, three week’s time a month ago. If you think of a majority of other crops, for example corn: A month ago there was no corn planted in the U.S. Today they are starting to plant it. 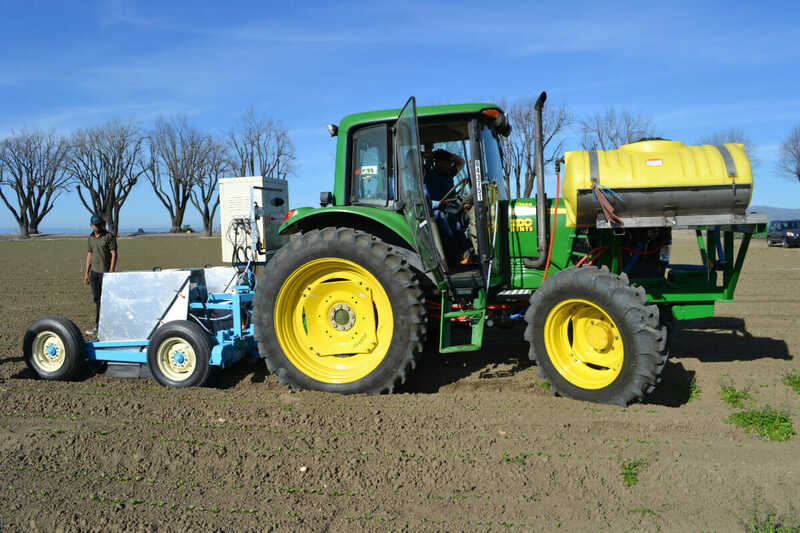 They don’t plant corn other than April and May in the U.S.
We want to do a machine that helps weeding, which is our very particular operation, and that means that for development purposes we’d need to do our testing just in that couple of months. But lettuce has a very long testing window. The next step for us is to go into other crops. Once we can get our technology working in lettuce, we believe that we can move to other crops in a very natural way. MF: What are the biggest issues facing farming today? JH: It’s my personal belief that we’ve been successful at growing more, but we’ve overlooked some things, which are quality of food, contamination, and the harm we’re doing to the environment. So I absolutely believe that it is time that we not abandon the quest for higher output, but enhance it by adding better quality, better process and moving away from chemical intensity and trying to be more conscious about the environment. My technology is all about producing food with less chemicals and less cost and doing it a sustainable way. I see my company as a pioneer, an enabler for technologies that will radically transform agriculture.